The vibrating reed type frequency meters or mechanical resonance type frequency meter indicate the supply frequency of the circuit directly and are very much convenient for most practical purposes. The vibrating reed frequency meter is a very simple instrument and has got an advantage of giving reading free from errors due to change in temperature, waveform and magnitude of applied voltage. 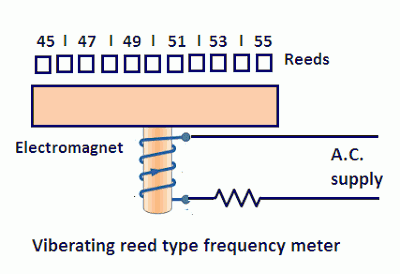 A vibrating reed frequency meter consists of a number of thin steel strips called reeds. These reeds are placed in a row alongside and close to an electromagnet. The electromagnet consists of thin laminations and a coil is wound around it as shown in fig. The coil is connected in series with a resistance across the supply whose frequency is to be measured. The approximate dimensions of the vibrating reeds are about 4 mm wide and ½ mm thick. The reeds are not similar to each other but differ either in their dimensions or weight or carry different flags at their tops. This is done to vary the natural frequency of vibration of each reed. The reeds are arranged in ascending order of natural frequency the difference in frequency is usually 1Hz. Thus the natural frequency of first reed may be 45 Hz, of the second 46 Hz, of the next 47 Hz and so on of the last may be 55 Hz. The reeds are fixed at the bottom end and are free at the top end. The flags at the top of reeds are -painted white, and the frequency is read directly from the instrument by observing the scale mark opposite to the reed which is vibrating most. When the vibrating reed frequency meter or mechanical resonance type frequency meter is connected across the supply whose frequency is to be measured an alternating current I flows through the coil of an electromagnet which produces a force of attraction on the reeds. The force of attraction is proportional to the square of the current therefore it varies at twice the supply frequency. Hence a force of exerted on the reeds at every half cycle. All the reeds thus tend to vibrate, but only the one whose natural frequency is double that of supply will vibrate appreciably. Mechanical resonance is obtained in the case of this reed. The frequency is determined, therefore by noting the scale reading opposite the reed that vibrates with maximum amplitude. 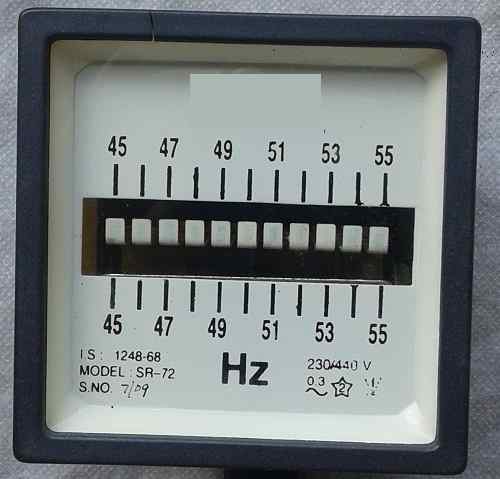 The tuning in these meters is so sharp that as the excitation frequency changes from resonant frequency the amplitude of vibration decreases rapidly becoming negligible for a frequency which is slightly away from resonant one. Thanks for reading about mechanical resonance type frequency meter working principle. © http://www.yourelectricalguide.com/ mechanical resonance type frequency meter or vibrating reed type frequency meter working principle.